POLITICAL TIDBITS: Unlike senators who are elected at large & deal more with national issues, House members constantly come to grips w/ constituents' gut issues. This difference is root of impasse between the two chambers over P3.8T budget for 2019, as House insists on "itemized" sums (easier for grant to local constituencies). Unlike senators who are elected at large & deal more with national issues, House members constantly come to grips w/ constituents' gut issues. This difference is root of impasse between the two chambers over P3.8T budget for 2019, as House insists on "itemized" sums (easier for grant to local constituencies). Senate President Vicente Sotto III and House Speaker Gloria Macapagal Arroyo---at loggerheads over budget items. The current imbroglio over the 2019 budget amounting to P3.8T illustrates the difficulty of having two chambers of Congress--- how much easier it would be to deal with only one chamber. Yet, given the current Philippine situation---the unpredictability of the country's leadership and the malleability of a lot of members of Congress---it may also be a blessing in disguise that we have two chambers. For if there were only one chamber, there may be no adequate check-and-balance system, specially given the tendency toward strong-man rule of the incumbent tenant of Malacanang. That said, having two chambers of Congress oftentimes constitutes a real pain in the neck. Take the current over a month-long impasse over the 2019 budget that was separately ratified by the two chambers of Congress last Feb. 8. Transmittal to the President for his signature has been much delayed as a word war has intensified between the Senate and the House over lump-sum appropriations in the budget. The Senate accuses the House of making "unlawful post-ratification" amendments, including realignment of funding for public works and health centers. In turn, Speaker Gloria Macapagal Arroyo questioned the lump-sum appropriations that were retained in the proposed budget---arguing that such sums are "unconstitutional." She was quoted as stressing: "No lump sum," adding that the House just wants to see the details---that appropriations be "itemized." The Speaker sent San Juan Rep. Ronaldo Zamora to the Senate in an effort to recall the House version of the 2019 budget that had been submitted to the Senate President for signing. 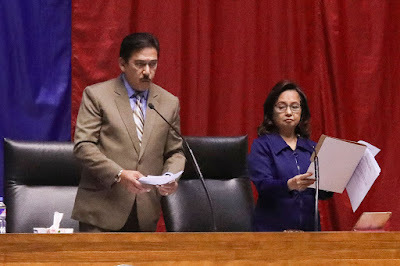 Senate Chief Sotto has refused to sign it, also arguing that it contains "unconstitutional" amendments made by the House after the Feb. 8 ratification---which the House flatly denies. .
Camarines Sur Rep. Rolando Andaya also reminded Rep. Zamora that no congressman had the authority to recall any enrolled bill without the plenary's approval. Thus, the Senate has its own version of the budget bill and so does the House, but the two versions have to be reconciled prior to transmittal to the Chief Executive for signing into law. Speaker GMA has held on to the House version of the budget bill as she insists that her chamber will continue to advocate that no lump-sum appropriation would be retained in this bill. This issue---to carry lump sums in the budget bill, as the Senate wants, or to itemize those lump sums, as the House demands---has not been resolved, despite the month-long negotiations between the two chambers of Congress..
What upsets the senators is that as far as they're concerned, the House bill should already be signed by Speaker GMA after Senate President Sotto already signed it---so that it could already be transmitted to the President for his signature. Recall that the bureaucracy is now operating under a REENACTED BUDGET---hence the understandable clamor for the new budget's ratification by the two chambers and its signing by the President. Senate President Sotto is miffed as well as puzzled about the House's resistance to lump-sum appropriations in the budget, when according to him, the state of these items should have been raised during the bicameral conference committee hearings. Sotto was quoted as saying that the "central issue" was the "arbitrary decision" of the congressmen to allocate P95.1B in infrastructure funds to select congressional districts. On the other hand, Speaker GMA is obviously under tremendous pressure at this point to help her House colleagues get hold of funds for their reelection. Because House members are elected by districts, they are truly more susceptible to disposal of funds to the electorate come election time, as their playing field---their respective districts--- is very specific and constricted. Thus, theirs is unlike those of the senators who are elected at large, all over the country. Thus, in the various districts, funds are badly needed to get the House members reelected---e.g., funds for job-generation, school-houses, road projects, health centers, etc. As Sen. Panfilo Lacson was quoted by the Inquirer, "Blame (the impasse) on the dizzying pork." Senate Chief Sotto has stressed over and over that he would sign the budget bill only if it was the original bill ratified last Feb. 9. On the other hand, Speaker GMA warns that no budget bill would be transmitted to the President--- unless the two chambers reach a compromise on the distribution of the funds. It's a tough game for the veteran politician that GMA is, indeed. Let's see how President Duterte will solve this problem for his close ally.